Richard was just nine years old when he and his friends used to walk to the Cincinnati Zoo. He especially loved watching the enormous elephants. Did he know one day he would bring his kids and even his grandkids to gasp at the size of the elephants? Maybe not. But he and his family have never stopped visiting. As they planned their financial future, Richard and his wife Catherine reflected on how fortunate they have been in life. They first considered putting the Zoo in their will, but then realized how much they would enjoy giving back now — while they can still watch their grandchildren recreate Richard's own happy childhood memories. So he chose to direct the Required Minimum Distribution (RMD) from his IRA to the Zoo when he turned 70 ½. 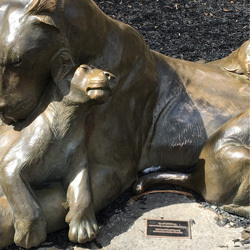 A plaque mounted on the lioness statue now honors their generosity. 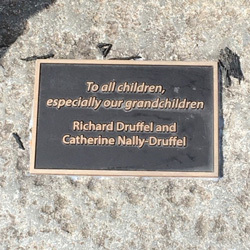 It reads, "To all children, especially our grandchildren." When the time comes for you to make decisions about your RMD, please consider using it to support the Zoo. You'll help millions of Cincinnatians continue to make wonderful family memories. To learn more please contact Mary Ann Remke, MBA at 513-487-3342 or maryann.remke@cincinnatizoo.org. Mary Jo Peairs has ridden her bike around the entire perimeter of the United States since she retired, but she always finds her way back to the Cincinnati Zoo. This unstoppable former Wyoming Schools kindergarten teacher inspires others in her role as a volunteer educator at the Zoo. She especially likes talking about our efforts to rescue and rehabilitate manatees. "I love seeing the awe that the Zoo inspires in people," she says, "Especially when they see that there are things they can do in their own lives to help protect species." 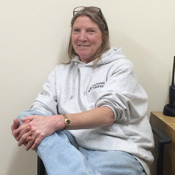 With her passion for the Zoo and for others, Mary Jo made a simple decision when her financial adviser told her it was time to start taking the Required Minimum Distribution (RMD) from her IRA. She directed the RMD to the Zoo. By law, an IRA owner must start taking distributions at age 70 &frac; so that taxes get collected on IRA monies that have never been taxed. However, by sending all or a part of the RMD to a charity, taxes are avoided on the portion given to the charity — up to $100,000 dollars! Qualified charities get the entire gift for their programs, would-be taxes included. 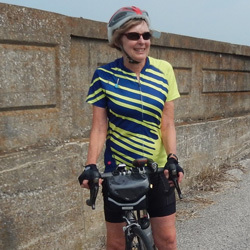 Mary Jo has only two states to go before she has cycled across every state in the U.S. She keeps going strong, and through her RMD, helps ensure that her beloved Zoo does the same. When the time comes for you to make decisions about your RMD, please consider using it to support the Zoo. For more information contact Mary Ann Remke, MBA at 513-487-3342 or maryann.remke@cincinnatizoo.org. 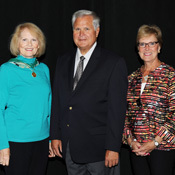 Ellen and Bill Camm were honored with Voices of Giving Awards for their estate gifts to the Cincinnati Zoo & Botanical Garden, represented by Sally Alspaugh. The Voices of Giving Award is an event sponsored by the Greater Cincinnati Planned Giving Council and offers the opportunity for honoring planned giving donors by member charities in Cincinnati. The strongest relationships are built on shared interests. Married 40 years, Ellen and Bill Camm share not only an interest, but a true commitment to protecting cats of all stripes... and spots, and any other pattern! From their generous support of our Zoo's cheetah program to the rescue of their own feline companion, Minette, they work as a team to protect their favorite animals. "The Cincinnati Zoo has always prided itself on its big cats," Bill says, "lions, tigers, cheetahs, all of them." And he should know; he's been visiting for around 60 years. His parents brought him to the Zoo as a child. Years later, he listened to the roars of lions from the on-call room in a nearby hospital where he was a medical resident. Today, Ellen and Bill want to help protect the animals they've come to love because of the Zoo. "Many of these species will become extinct unless zoos step in and try to save them," Bill points out. Ellen moved to Cincinnati in the 1970s and earned her MBA at the University of Cincinnati. She soon discovered the Zoo herself and the two have enjoyed watching it blossom over the years. "It's been very meaningful to our lives, so we help and support them however we can," they say. 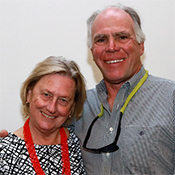 Now retired from successful careers, Ellen in publishing and software, and Bill as an MD, the two reside near Naples, Florida. They travel back and forth between a home there and one in Northern Kentucky, always with Minette along for the trip. Meanwhile, they keep a close eye on the Zoo through the blog and social media. They watched with fascination as three premature cheetah cubs fought to survive in 2016. 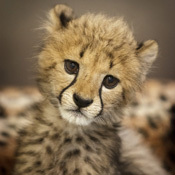 Ellen remarks, "There are fewer cheetahs even than we thought. It's so important for zoos to help keep them from becoming extinct. They're beautiful animals, and they certainly need to be protected." Ellen and Bill's support for the cheetah program dates back many years. "Catherine Hilker (founder of the Zoo's Cat Ambassador Program) has been a mainstay," recalls Bill. "We remember when Angel was an ambassador cheetah and Catherine would bring her to Zoo functions." Ellen adds, "We like that the cheetah program goes into schools, so children can see the cats live and learn about where they live in Africa. Some people in this city have never stepped foot outside the city limits, so seeing these animals at the Zoo is the only chance they'll ever have." Their passion for cats doesn't stop with the Zoo. They helped Miami University, Bill's alma mater, collaborate with the Zoo to preserve the remains of a beautiful snow leopard named Olga. Bill recalls, "When this opportunity came up, we gladly jumped in." The Zoo donated her remains to Miami. Biology students got to take part in the preservation, which the Camms helped fund. The university's Hefner Museum of Natural History now displays the remains in a naturalistic setting that allows students to learn about this majestic animal. The couple also volunteered together at The Scratching Post, a cat rescue in Cincinnati. Both grew up with pets, and Bill says, "I think that's what drew me to the big cats when I would visit the Zoo as a child. I think that's just part of my DNA." Since moving to Florida, they've also become interested in the plight of the endangered Florida panther. Ellen and Bill express pride in the Zoo's contribution to the city and to the world at large. Looking back, Bill notices, "Over the years the exhibits have changed... they're more environmentally friendly. The zoo is ever more dedicated to the health of the animals." And, they're inspired by other supporters. "I look back at some of the major donors who have made the zoo even better than it was when I started going 60 years ago," Bill says. "There have been many generous Cincinnatians who have made a difference while they were alive and even after they passed away." The Camms travel to other zoos whenever they can, and they'll continue to visit the Cincinnati Zoo regularly. "Last fall we had a wonderful tour behind the scenes," Ellen recalls. "The keepers were so generous with their time." Bill adds, "The Zoo has a lot of amazing employees who have dedicated their lives to helping animals have a better life." We're grateful that "cat people" like Ellen and Bill care so much about giving those animals better lives, and about improving life in Cincinnati. I received a very pleasant message back in August from a 1978 graduate of what is now called our Zoo Academy. This is a program for juniors and seniors in high school to achieve their high school diploma through the Cincinnati Zoo & Botanical Garden. She was in the second graduating class and recently came to tour the Zoo with me. She said so much has changed for the better including that the Zoo Academy’s program is now a college readiness program whereas when she attended it was more of a vocational program. Now we have designated classrooms, laboratories and even lockers for the students who attend! Back then, it was a very new offering through the Cincinnati Public School system and it is still going on today. We should be very proud of our program both for the Zoo’s foresight in this and for our community. "I'd like to discuss estate options. I was a student of the Cinti Zoo Academy's 2nd class and would like to include the zoo in my estate planning. Although I have always had this in mind, I want to offer my whole hearted support of the zoo in light of the devastating loss of Harambe and excruciating decision the zoo staff had to make to save a child. I got to know a lot of the zoo staff as a student there. I know this was the worst conceivable option for them to make. Please feel free to contact me to discuss further. – Thanks." On a recent trip to Naples, I called on two Zoo donors to say ‘Hi’ and to bring news from the Cincinnati Zoo & Botanical Garden. Betsy and I enjoyed a lovely waterside lunch and we will stay in touch into the future. Marcella was born in 1918 and died ninety years later in 2008. She married but had no children. Her sister Marion was born in 1919 and passed away this year at age 97, never having married. 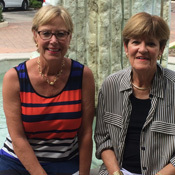 Both sisters established Charitable Remainder Trusts with themselves as the income beneficiary for life and each other as remainder income beneficiaries. So when Marcella died in 2008, the income from her trust continued to pay to Marion until her death. They both listed the Zoo as one of three charitable beneficiaries to receive the proceeds upon the passing of the second to die. In addition to the Charitable Remainder Trusts, they set up revocable living trusts that also left income and assets to the remaining sister and ultimate distribution to the same three charities. So a month or so ago, the Zoo received four checks representing the final distributions from these four trusts from these two generous women. Unfortunately, we never knew them. They must have come through our gates at some point in the past, but we were unaware of them. The moral of this story is that we will continue to strive for excellence in all we do so that our guests, like Marcella and Marion, will take note of the exceptional place that this is regardless of whether we meet them or not. We may never know when we are sharing our hospitality with unknown future benefactors. "Bill, our trust officer, spoke to us numerous times about setting up a charitable lead trust that would ultimately benefit our grandchildren. He suggested that we could fund a trust that would pay income each year to our favorite charities for the next 20 years and then distribute the principle to our grandchildren. This would help us to know that we have done something significant for our heirs, as well as for the charities that mean so much to us. From a tax benefit standpoint, we are moving significant assets to our grandchildren in a very tax favorable way. That made a lot of sense, so we did it, and possibly will do it again if the circumstances are right. We love this idea." I recently got a call from Sam who asked about a gift annuity for his wife who believes deeply in the mission of our Zoo. In fact, according to Sam she spends more time on the Zoo's web site than any other site! Sam just retired and has a deferred compensation plan from his employer that will end in nine years. He also had some highly appreciated stock that he knew would make a great gift to the Zoo. By gifting the stock to the Zoo for a charitable gift annuity, he could utilize 100% of the value of the stock to fund the gift annuity for his wife's benefit. He also gets to use 53% of the value of his gift as a tax deduction on next year's taxes. By deferring the payout of the stock for nine years to coincide with the end of his compensation plan, the payout percentage was much higher (7.8%) than if he took an immediate payout (5%)*. In 2025, when the annuity payment begins it will last for the rest of his wife's life and the amount is guaranteed! It won't matter what the stock market does over the rest of her life or even between now and then. This set of circumstances is perfect for this type of arrangement. Contact us for other unique ideas. *Both rates are based on the age of the annuitant, the current government mid-term, and the American Council on Gift Annuity rates.